It was 400 am in Bogota, kind of chilly weather outside. Although we are really close the Caribbean, we can feel the coldness of being closer 2600 mts to the stars. I never understood that in this tropical country. I just slept a few hours, maybe just a few half hours. 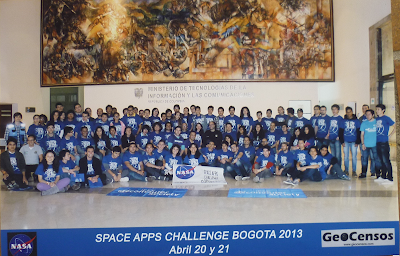 I had to get up because my spaceapps heroes needed me. I had to be there for them, I have to be attentive for them. Although I am a well know heavy slepeer, this time I got up with joy and a mission. The great experience of the first day of our successful hackathon and the nice moments we went through with our team, rushing, coworking, communicating and having fun, all that made me walk right out of the sleeping bag. In the programming floor, the ailes, the mini - talks spaces and the tables pilled-up with empty energizant beverages. There was a feeling of accomplishment, also mingled with a comradely happiness in the middle of the night and that special productive focusing. Some people coded, some people played videogames quietly and some people were just sleeping exhausted sitting bended over their tables with their arms crossed holding their head, like in candid prayer in order to finish their project with time but also with enough energy . Many came here because of some fellow university companions recommended them to do so. Some saw the bright black and multicoulored signs in their universities, some saw just a brief tweet on their account and immediately got into the space scientific craze, just in a second. They HAD to be here. The setting of the location was not an easy thing to do. So many stakeholders to speak to so many interests to negotiate with: The National Ministry of technologies, two local technology companies, so many visits to universities and hackerspaces of wishful and participative enthusiasts, not to mention the numerous conference calls with media and broadcasting educational organizations we celebrated. Besides, there were the flights to Santa Marta in the Colombian Caribbean coast where UniMagdalena supported a satelllite with my friend Samuel Prieto (thanks!) in charge and the feverish follow up of email and skype communications with Panamenian and Venezuelan satallites. However, all sacrifices, unplanned expenses, endless meetings and burdensome bureaucracy deserved the effort in order to have the event in Bogotá. All that somehow boring stuff was totally over compensated by the exciting, moving and determined drive of participants to be there in our venue. For them, anything to get a spot in the event: they left totally behind all that endless queue outside the venue, the anguish of having to deal with foreign language text websites and challenges formulated by the NASA guys and their friends (because they are so clever), the speculative talks with hackers, the frenzy rush to go to promotional talks , sometimes having to print posters and subscribing to challenges and organizing groups, ideas, projects, tools, feelings. They were there because they wanted, because they felt they had to be there, they had to do something more, maybe to help humanity, maybe to have fun. Anyway, the idea of sharing the night with friends and classmates was really attractive, doing what they always loved: coding and solving difficult problems. What is really weird is that they had a really good time at 4 o´clock in the morning although the appalling long work hours and probably having to go back home in a crammed “buseta” (local bus) without a nice week end rest until the next one in five days. Personally, I cherished every second of that great journey together and the kind and soft gift of our heroe´s concern and commitment to their dreams. And the great support of Fourtelco by the really awesome Olga Huertas and the herculean Edgar Rodriguez. God bless them. And the cherry of the pie came with an early morning surprise: Diego Urbina @DiegoU, our latino credit in the ESA Mars 500 mission talked face to face to our guys. He recommended dearly taking a look on many interesting websites about his work and I think our young geniuses were delighted to hear in Spanish a latino speaking about space exploration and its solutions. Finally, some hours later, the compensation to the sacrifice and the magic was evident. 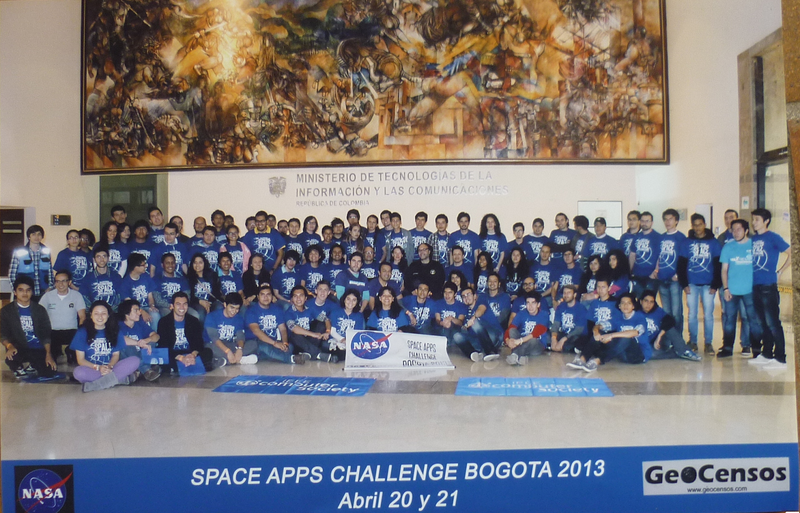 The first prize was awarded to a stunning we love data app “We love Data Bogotá”. The second and third was for two killer games: W&D curiosity and Juego Curiosity respectively. Also an Ipad for the best geographic project and many other goodies were given by the guys form Prosis ESRI who helped us so nicely and generously. not to mention the great foolow up of the event by canal ZOOM TV, a cable channel for Univerisitie´s broadcasting. And also special thanks to RENATA, the national advanced academic internet network. Well done, boys and girls! Whenever possible, GeoCensos and NASA will be there for you. Somehow, I think we all learned the value of sacrifice in order to create something new; we paid the price of the journey to a totally unexpected world, leaving it all behind just for fun. I guess this is the stuff dreams are made of. Espectacular!! !, podrían publicar también lo que grabo el canal ZOOM ?. Graciass y si la pasamos espectacular! Muchas Gracias Geocensos!